Indonesia is moving into election mode. There will be sweeping general elections in Indonesia in April next year for the presidency, the national parliament, provincial parliaments, and at the regional level across the nation. Australians might go to the polls around the same time, but there will be a big difference in scale. In Australia, around 16 million voters will go to the polls, while in Indonesia over ten times this number ­– nearly 190 million people – are enrolled to vote. The main contest at the national level in Indonesia will be between the incumbent, President Joko Widodo, and the challenger, Prabowo Subianto. From one point of view, this looks like being a rerun of the contest five years ago. In 2014, Jokowi (as the President is universally known) and Prabowo also squared off. 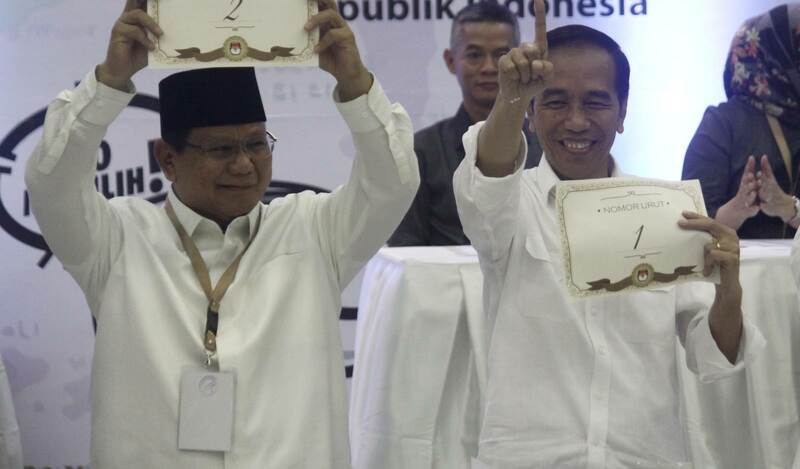 In 2014, it looked as if the contest between Jokowi and Prabowo would be close. Jokowi was a civilian newcomer to the national political stage promising reform. Prabowo, with a strong military background, had long experience in elite politics in Jakarta and had good financial backing for his presidential bid. Things look different this time around. At this stage, Jokowi seems to be in a strong position. Numerous polls in recent months have put him comfortably ahead of Prabowo. But with five months to go to the polling day on 17 April, there is still time for Prabowo to make up lost ground. To close the gap, he will need to take any chance he can to discredit Jokowi – in social policies, economic affairs, international relations, and anywhere else he can find an opening to land a blow. The Prabowo camp is playing politics with major China-supported programs to suggest that Jokowi’s drive to build infrastructure in Indonesia is too dependent on foreign support. Recent statements from Prabowo suggest that he is keen to present himself as a true nationalist, second to nobody in his love for people and nation. Jokowi, Prabowo has implied, is inclined to be too friendly to foreigners. Last month, for example, the annual meetings of the International Monetary Fund and the World Bank were held in Indonesia for the first time in the nation’s history. The meetings were a major event, providing Indonesia with a key opportunity to showcase national economic potential. Nevertheless, Prabowo saw a useful opening to score points off Jokowi. Noting that humanitarian rescue programs were underway in Sulawesi after the devastating earthquake and tsunami in Palu in September, Prabowo called for the IMF-World Bank meetings in Indonesia to be curtailed. The money saved, he said, should be used to help the disaster survivors in Palu. It is certainly true that all possible efforts are needed to respond to the crisis in Sulawesi. But the suggestion that the IMF-World Bank meetings should have been be cancelled at short notice was pure political grandstanding. Over 12,000 visitors from nearly 190 countries were scheduled to arrive in Indonesia. Prabowo, playing the nationalist card, was clearly aiming to suggest that Jokowi preferred to meet with foreign visitors rather than attend to the urgent needs of disaster survivors within Indonesia. Prabowo’s team has played other nationalist cards as well. Just a few weeks ago, a leading member of Prabowo’s election team questioned whether China’s support for a key infrastructure project in Indonesia should be accepted. Prabowo’s brother, well-known businessman Hashim Djojohadikusumo, has been providing financial support to Prabowo’s presidential bid. As part of Prabowo’s team, Hashim called for a review of China’s involvement in a proposed US$5.4 billion high-speed rail link between Jakarta and Bandung. On one level, Hashim’s suggestion that the planned Jakarta-Bandung rail link be reviewed was reasonable. It is always important to consider whether large infrastructure projects make sense. But the project is now well advanced. To cast doubt on the construction of the rail link at this stage is hardly helpful. The Prabowo camp is playing politics with major China-supported programs. The aim is to suggest that Jokowi’s drive to build infrastructure in Indonesia is too dependent on foreign (in in this case, Chinese) support. Perhaps it is too early to take much notice of these pre-election manoeuvrings. Five months is a long time in politics. Much can happen in Indonesia between now and April. But the overall campaign patterns are already clear. Jokowi will project a steady-as-we-go message, emphasising stability and his well-known concerns with the personal lives of Indonesians in urban areas and villages across the nation. Prabowo will aim to undermine Jokowi’s narrative of his role as a simple man of the people and will work to present an alternative vision. Prabowo will need to build credibility across Indonesia before his challenge can be seen as posing a real threat to Widodo’s re-election in April next year. At this stage, Jokowi looks strong and the election is his to lose. The proposed ban on HTI looks very much like an abuse of state power for political aims.